In celebration of the Puma Suede’s 50th anniversary, PUMA has tapped into creatives, designers, and artists, including The Weeknd, to put their spin on the iconic sneaker. 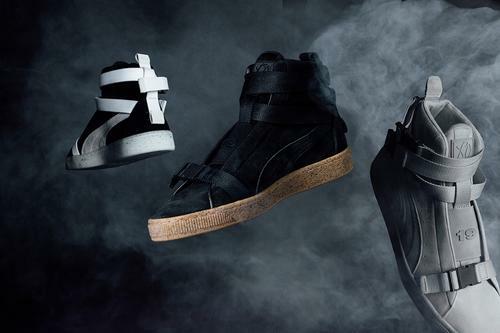 The Suede 50 PUMA x XO collab is a remix of the iconic silhouette, as The Weeknd pays homage to the legendary sneaker by delivering a mid-cut boot with a military feel. Available in three colorways, the contemporary design goes laceless, instead opting for buckle straps that wrap around the toe and ankle of the shoes. Additional details include a “19” which sits at the center of one tongue and “68” at the other, as a nod to the year the Puma Suede was born. The black boot features a fully monochromatic plush Suede atop a speckled gum sole. The "Glacier Gray" rendition includes silver metallic buckles on the straps and a gray speckled sole, and the black and white boot features a black suede upper wrapped in white straps and metallic black buckles, accompanied by a thick, white sole with black speckles. The Weeknd’s collaborative PUMA Suede is set to release on August 11.